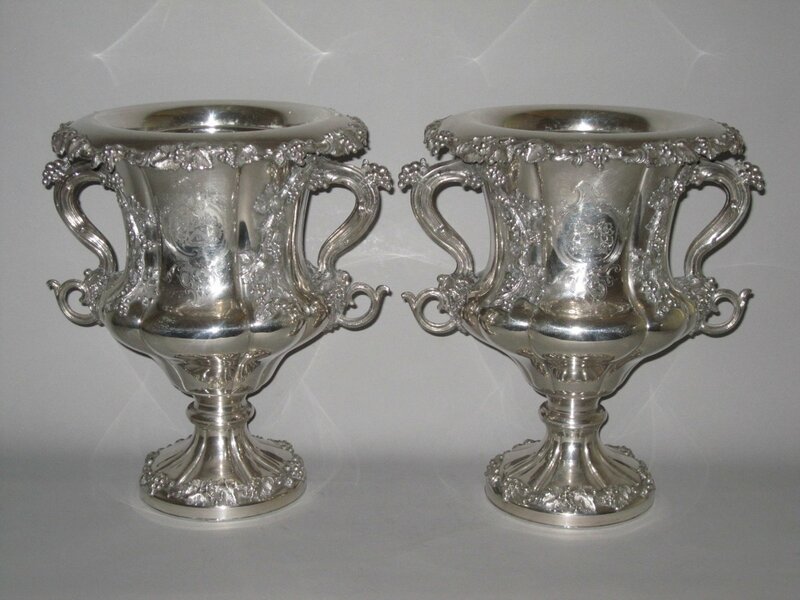 AN EXCEPTIONAL QUALITY PAIR OF OLD SHEFFIELD PLATE SILVER WINE COOLERS, CIRCA 1830.
by HENRY WILKINSON & CO., NORFOLK ST. SHEFFIELD. Each urn-form body flanked by upswept handles and raised on a pedestal foot, elabourately cast all over in high relief with vines and grapes, with a removable liner. Each with an engraved armorial within a cartouche, repeated on front and rear. Motto: Passant Cressant En Honneur.-.Progressing in Honour.